Thanksgiving is my favorite holiday, a sentiment sure to be shared among many US-Americans. 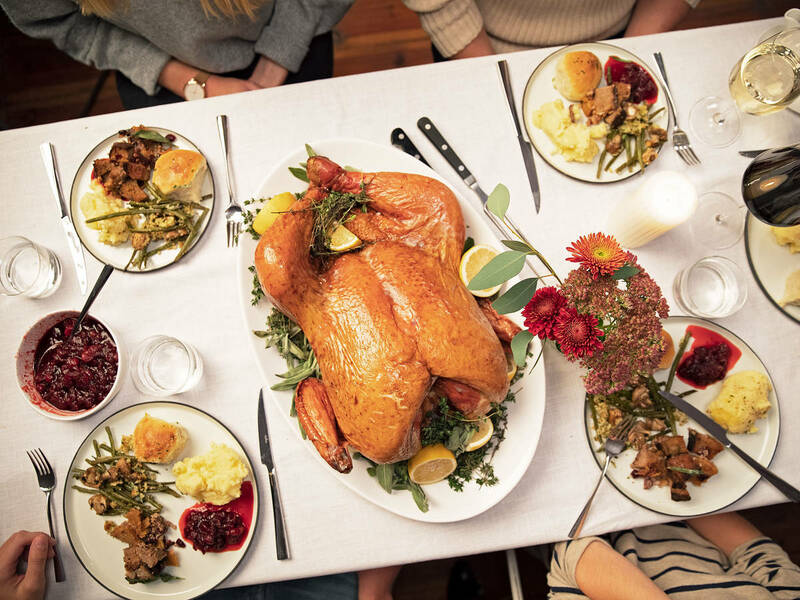 Over the years Thanksgiving has meant a variety of different things to my family and friends but there's been one common thread: More than anything, Thanksgiving is a feeling—one that, with the right stuff, can be fostered anywhere. It’s a feeling of bounty, of warmth, of turkey and mashed potatoes, of green beans and stuffing (don’t you dare call it dressing! ), of falling asleep on the couch to be gently woken by your little cousin who doesn’t want you to miss out on pie—it’s about a generous meal that takes effort to prepare, but very little to enjoy. Every family or group of friends has their own tradition, and I’ll be carrying out my own this year with new friends and old. I won’t even be nervous—because, along with the help of Bosch, I’ve got it all planned out. Getting mountains of hot food to a table is a difficult task for anyone, and with expectations as high as they usually are when it comes to a Thanksgiving meal, the added pressure can be enough to throw any capable cook off their game. That’s where planning comes in. I can still picture the scrawled checklist my grandmother kept in the kitchen on Thanksgiving morning: make the cranberry sauce at 11, check the turkey at 12, warm the rolls at 2, get the coffee going at 4:30. Written down like that, it seemed easy, but after years of helping out in both the kitchen and front of house (so to speak), I know that in addition to the list she kept beside her day-of, she had gone through a handful of others leading up to it—guest lists, grocery lists, dish lists, menu plans, seating charts. But the point is not the type of list made, it’s that lists actually do serve to help you remember things you might forget in the moment and recognize gaps in planning that you might not see until it’s too late. In short, lists and planning save, and every great host no doubt does both. But it doesn’t have to be boring—in fact, it shouldn’t be. Sit down, tune into your favorite album or podcast, pour yourself a nice glass of something cold or comforting, and tuck in—we’ll show you how. We’re all different kinds of cooks. We range in capability, skill set, the things we like to make and don’t. There are bakers who refuse to cook, cooks who refuse to bake, and just about everything in-between. The first step in planning a Thanksgiving menu (any menu really), is to assess your strengths and weaknesses. Then and only then can you design a menu that both plays to your strengths and gives you the confidence to pull it off. If you’re not extremely comfortable in the kitchen, even when cooking dinner for yourself on a weeknight, you can still host Thanksgiving—just take it easy and stick to the essentials, relying heavily on casseroles, simple vegetable purées, and store-bought rolls and pies, to shift your focus to nailing that stunningly juicy turkey. And don't forget to rely on your appliances to help you through the day; from warming functions to quick pre-heating, we'll show you when to deploy these often underused but incredibly helpful features. Those a bit more comfortable in the kitchen can think about working in one or two dishes that might present more of a challenge. Intricately latticed pies, homemade Parker House or White Mountain rolls, or a more technical take on potatoes—cheesy potato soufflés or three-potato gratin—anyone? The only real rule of thumb to follow when it comes to planning Thanksgiving dinner, is to remember this key word: Variety. You want variety in textures, colors, ingredients, even temperatures: something baked, something crunchy, something soft, something cold, something vibrant, something juicy, something saucy. The classic Thanksgiving menu does a good job at covering all of these bases, so to continue with menu planning, I’ll start there. Whether you grew up on the East coast, West coast, in the Midwest, or the South, I’d bet the staples that hit your Thanksgiving table can be generally outlined as follows: turkey, potatoes—mashed, gratinated, or topped with something sweet, like marshmallows or brown sugar, greens—beans or otherwise, stuffing (or dressing, if you say so), rolls, cranberry sauce, and, as is often the case, one or more types of pie from the classic trio: pumpkin, apple, and pecan. This menu is pretty much set and for good reason! So, in an effort to please everyone, give the people what they want and keep these dishes on the menu—maybe even enlist a guest or two to take an easily transportable dish off your hands and lighten your load. Keep the flavors classic, but balanced, and remember to keep variety in mind. If you use sage in your stuffing, choose other herbs (like thyme, tarragon, chives, or parsley) for your turkey, potatoes, and greens. Once you’ve decided which dishes you’re going to make, the next step is to figure out how much you need. And as Thanksgiving is nothing if not the holiday dedicated to overeating, you want to make sure you can be the host with the most—literally. Here’s a guideline for how much, per person, you should buy—keeping in mind the cherished Thanksgiving leftovers (it looks like a hefty purchase, we know!) and that one person who usually shows up unannounced. One of the most helpful things about planning (and making all those lists) is that it helps you decide what you should make ahead, and when exactly your oven will be able to handle it. But, what can you actually make ahead without sacrificing quality? Not everything can fit in your oven at once, even if you have a Bosch Benchmark, so getting yourself ahead of the game is key to serving everything fresh, warm, and at it's best. Stuffing: The day before, assemble the stuffing, cover with greased aluminum foil, and chill. The day of, bake off! If you find it’s a bit too dry, add a bit of warm stock or drizzle with some melted butter before serving—but we all know gravy gets the last word. Turkey: Two days ahead, thaw the turkey and release it from its packaging. The day before, brine the turkey for extra certainty that it will be juicy inside, with a crispy skin outside. The day of, bake it off, using the chart below to help you plan your timing. If you have an oven outfitted with an internal temperature probe, simply stick the probe in at an angle from the back of the turkey into the thickest part of the breast. Set the temperature you want to hit (the turkey will continue to cook even after being removed from the oven, so aim for 150°F) and keep your ear turned towards the oven! Cranberry sauce: Up to a week in advance, make the cranberry sauce. Store in an airtight container or in a serving dish wrapped with plastic wrap. The day of, set the cranberry sauce out to come to room temperature or serve it warm by gently heating it on the stovetop (even better if yours has flexible heat zones that make shifting pots and pans around throughout the day a breeze). Mashed potatoes: The day before, make the mashed potatoes, cover with plastic wrap directly pressed on top of the potatoes, and chill. The day of, transfer the potatoes to a pot over low heat. In a separate pot, heat some milk or cream and stir the hot milk or cream through until the potatoes are back to their best, creamiest consistency. Transfer back to their serving dish and keep warm in an oven with a warming function. Add an extra pat of butter on top before serving because, why not? Vegetables and miscellaneous herbs: The day before, wash any vegetables or herbs you’ll be roasting or adding to casseroles, salads, or using as garnish. Shake or pat them dry, trim as needed, and wrap in very lightly damp paper towels before storing in an airtight container or sealed plastic bag in the fridge. Pie: To give yourself a leg up when tackling homemade pies for Thanksgiving, you can make the pie crusts up to one month ahead. Roll and form them into the pie plate, then cover with greased aluminum or parchment, and fill with baking beans, weights, or sugar. Freeze them, and then blind bake (adding about 15 min. on to the blind baking time when going from freezer to oven), fill, and only bake them to completion the day before. Once cooled completely, cover with plastic wrap and leave at room temperature overnight. The day of, make whipped cream, if desired. Most fillings can be made up to a week in advance, covered, and stored in the fridge—just wait to add any nuts or citrus zests until directly before baking. For a thorough plan you don’t have to make on your own, print out our Thanksgiving checklist below and manage your mayhem with a little help from us. Now that you’ve got your lists in order, the menu planned, and a schedule for the days before and day of, the last thing you need are a few back-pocket tips that can add little extra something to your Thanksgiving feast. You’re probably thinking that, since Thanksgiving centers around an absurd amount of food, pre-dinner snacks and cocktails are not necessary—and we’d have to agree. However, should something go terribly wrong or dinner take more time than you’d expect, planning ahead and prepping light, simple snacks and refreshing sips can be a nice touch that serves to whet your guests’ appetites, not spoil them. Think spiced nuts that can be prepared up to a week advance and 3-ingredient cocktails that can even be made in batches the day before or whipped up in a few minutes by a willing guest. Both white and red wines often make an appearance at the Thanksgiving table, so having a few bottles popped open for light sipping before dinner is another option. Chilled ciders or beer (both alcoholic and non) are another festive alternative to cocktails or wine. Thanksgiving isn’t just about the food, it’s about the faces gathered around the table, be them friend, family member, or even foe—should politics or religion come up (as they tend to). Asking for a helping hand both in and out of the kitchen isn’t a sign of weakness, it’s another way to get people involved, feeling extra familial, and foster a little bonding while you’re at it. While Thanksgiving leftovers straight from the fridge can seem heaven sent, no one wants their meal to be cold the day of. In order to keep your guests’ food warm for as long as possible, warm their plates in a low-temperature oven or with its built-in warming function just before dinner. Warm plates mean warm food, at least for the first round! Even just the thought of a mound of Thanksgiving dishes spread throughout the dining room and kitchen is enough to send shivers up one’s spine, so try to cut back on the dirties any way you can. The simplest way to success is to use baking and cooking vessels that double as serving dishes. After your menu is set, plan the serving dishes out ahead of time so you can pick up any extras you might need, or roll up those sleeves and mentally prepare yourself for quality time spent at the kitchen sink. Another way to cut down on dishes? Get one step ahead and run a quick load of plates in-between courses using your dishwasher's speed cycle, like the Bosch Speed60, to be ready in time for dessert. If you don't have any plates to run, simply keep your dishwasher partially open and make sure to let guests know they can be a major help by simply loading their own dishes after dinner. As amazing as Thanksgiving leftovers are—I mean, is there anything better than slathering a thick slice of bread with cranberry sauce and mashed potatoes, piling on sliced turkey and a small hump of stuffing, and drowning it with hot gravy?—you don’t want to be left overwhelmed with a full fridge. Buying a few compostable or recycled containers or asking your guests to come prepared with their own airtight glass or plastic containers will help you easily divvy up any leftovers. Just don’t forget to save some for yourself—you deserve it! Growing up, when my grandmother would host Thanksgiving, I remember her never really setting herself a place at the table—she’d simply be too busy hosting to sit, eating little bits of everything in the kitchen as she was tasting for seasoning, walking through the dining room to top off waters and wines, only truly joining the group when the coffee was brewed and the pies were being served. I never liked that she did this, but that didn’t stop her from keeping me seated when I would offer to help. After the hustle and bustle, the checklists and the anxiety, shouldn’t you make time for yourself to enjoy the day right alongside your guests? I for one, say yes. After all, that moment where you get to sit down at the table with friends, family, and the food you’ve toiled over is what the holiday is all about. And as chaotic as it might seem, we know that no matter the Thanksgiving mayhem you might find yourself in, you can manage it.